Short update today. Though I hoped that adding more structure would keep me motivated and allow me to get things done more smoothly, I underestimate how much work can take out of you. Last game jam I was still in college and felt like I had tons of energy. This time around I find myself just drained everyday when I come back from work. Work life balance is definitely something that is still a work in progress for me. Regardless here's a short scene that I've written. The rest of today will probably just be more writing. Okay well. tl;dr here's a summary. Please do ask if you're curious about anything below. I am just too crushed to rewrite everything but would love to go into depth if y'all are interested. Update 1: Games are interactive. Did some stuff yesterday here's what I decided. 1) I wrote yesterday and decided on a plot structure. It looks like this. 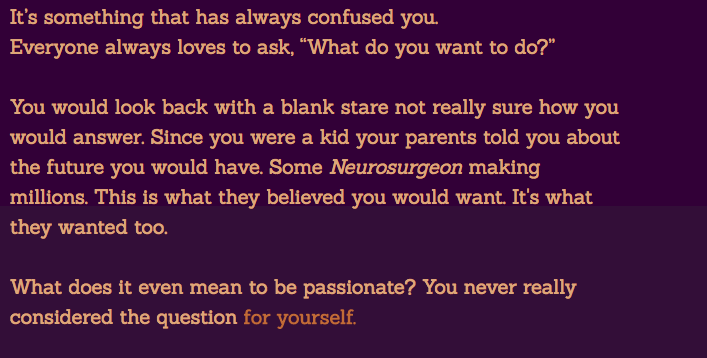 2) My Protagonist needs to be a superficially good person but also needs to have some pretty deep flaws. - ie. Maybe his insecurity or shyness leads to toxic idolatry. Maybe he's confident and that turns into an unwillingness to let things go and a controlling personality. 3) Amy needs to be a foil for the protagonist. She needs to be perfect in the mind's eye of the protagonist, but flawed enough so that players believe her character. 4) Hope to get ~8,000 words approx. Writing done by the end of this week. Today I want to write out the second path for the players. 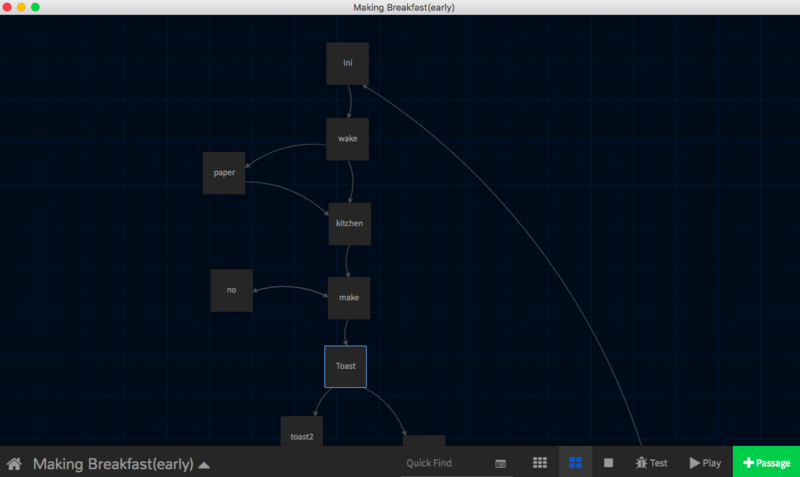 I also want to do some implementation into Twine. My name is Jimmy! I'm a 21-year old working boy. I don't have much background making games. My only completed project was the result of the Winter 2018 "My First Game Jam!" I really loved the experience and wanted to get back to it after struggling to find motivation to make stuff outside of a structured environment. I'm really looking forward to making games in parallel with the folks who join this game jam. It was really fun last time around seeing everyone make stuff!! You are Dating Amy - Concept. 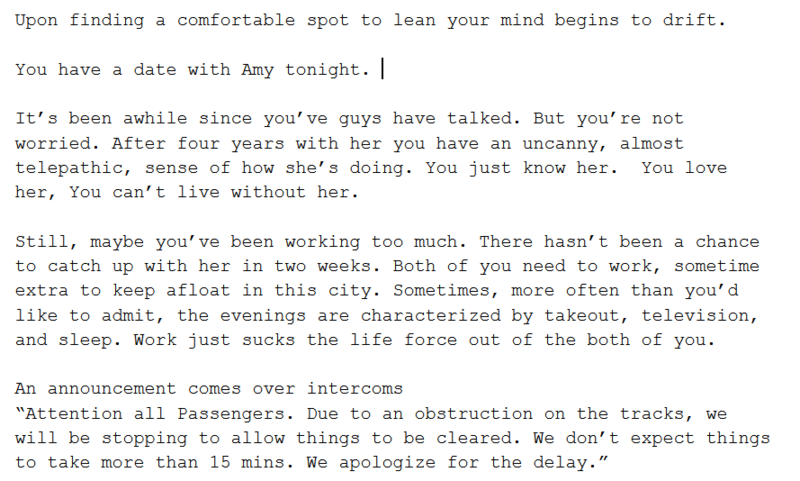 My basic pitch and idea for "You are Dating Amy" is a piece of interactive fiction. It borrows elements from dating sims and repetitious play. At its core it's an exploration of obsessive behaviors in dating relationships through the mechanic of repeated play. In the game you play a person who is going on a date with Amy. Little do you know that she will dump you during this date. You, as the player, have the option to replay the game under the impression that you are able to make choices to prevent the breakup. As you repeatedly play, more options open up showing how desperate the player character is becoming. These options will intentionally be absurd and outrageous given the context of the setting: that is a normal date. (One example might be that you are able to propose to her in the 3rd or 4th play through as a means of saving the relationship.) You as the player know how things are going to end, but the player character does not. The intent is to show how unhealthy it can become to be unwilling to let things go within relationships and how dangerous it can be to be obsessed over someone. The premise of the game, in many ways, represents lots of things that I have come to learn personally over time. The game will probably follow a similar format as the game I made for the earlier jam. I will be using twine again and there will be minimal graphics. Key Inspirations: Save The Date by Paper Dino, The Stanley Parable, Firewatch. 1) Write a substantial amount of text. - For this premise to work there needs to be a lot of writing involved. I want the player to be able to play through the game several times over with new options opening up each time. - Last game jam I underestimated how much writing would be needed to create a substantial game. This time around my aim is to make more game. 2) Develop better structured work. - I think last time I did a game jam I sorta worked whenever I could in a willy-nilly fashion. It was fun, free, but not very structured. This time around I want to do a better job of managing my time. - As such I'll be setting daily goals for myself as well as committing to daily check ins. Though they are not always going to be long and extensive. I largely agree with the criticism. Looking back, I multiple endings was somewhat of a mistake. I would have liked for the story to progress in a more interesting fashion. During development, however I was somewhat limited by the time frame of the jam which this game was first created. It was hard to rewrite and expand some scenes to be more varied without radically changing the narrative. Without getting into spoilers, it's tough to expand beyond the experiences already present in the game. Furthermore, during initial playtests, I found that people appreciated the emotions within the game conveyed through it's conciseness. That is to say, there didn't need to be more for the emotions/themes to be understood. I think for these reasons I was less concerned about creating more interesting paths for the player. Thanks again for the support! :) I appreciate knowing and growing from hearing about people's experiences playing the game. The process of writing and really designing the narrative of the game was really chaotic. When I set out first writing all I had was a rough prototype of a story I wanted to tell and a specific plot: A person waking up and making breakfast. At the time I had envisioned the story to focus on the protagonist’s anxieties regarding College, but over time I felt that the script began to drift from that topic. As I was writing, and as I was putting more of myself in the protagonist, I found that the end result was much closer to a story about the relationships between the protagonist and their parents. There is a lot of scenes in the game that make reference to moments pior to the character’s college experience and how those memories influence how the protagonist progressed. So much of the overall narrative in the game was discovered in the process of writing. I think this ended up being both good in some ways and bad in others. Overall I feel like the writing in the game is stronger than it was originally. I find that the narrative choices that are presented to the player are more compelling than the choices I previously had in mind. These are the unexpected positives that resulted in this process. But… It could have been better. There was no real planning in story beats. The writing sort of came out of whatever I felt was interesting. There was no storyboarding or blocking of the narrative that was done. I’m not sure if this had an impact on this game in particular as the scope is relatively small, but I can sense how certain story elements aren’t fully explored. There also isn’t very much room for expansion as it’s difficult to parse where that would be without the overhead perspective that a storyboard would provide. Overall I’m pretty satisfied with the writing. I’ve gotten some compliments to the friends I’ve showed it to and, based on the limited feedback I’ve gotten, people seem to understand the themes I was trying to convey. Huge moral boost but at the same time there’s a lot that I want to improve for whatever is next. I alluded to this during my dev log but spending time working on this game has been some of the most fun I’ve had in a long time. As someone who’s always had a critical opinion of himself, I didn’t have the greatest confidence that I would finish or be able to create something meaningful in such a short amount of time. I’m happy to say that this entire process of pushing myself and really discovering that I’m more capable than I give myself credit for. It’s incredibly satisfying to be able to create something and put it out for people to experience and play. Finding a community here in the game jam and at itch.io in general has kind of been incredible as well. I’ve never really had people around me who were interested and focused on making games or thinking critically about aspects of game development. Seeing everyone work on something in the same time frame was amazingly encouraging. The reality isn’t lost on me though, I know that not many people are going to find this tiny game that I’ve made and even fewer people are going to provide feedback. Even so, the experience was great and I am proud of everything that I’ve done. I’m even more excited for what is to come. I hope to see you again in other jams and across the internet. Update 9: Weird Feelings, Finished Games. I submitted the game!!! Between the last update and this one I didn't really change all that much. There isn't much more that I can do in this time. There's lots of things big and small that I would change if I had another day, week, or month of concentrated time, but I set out to finish something and I'm proud of the progress I've made. Some interesting observations: In total I spent about 25~ hours on this game. About 18 hours between initial design to finishing the narrative development of the game. And an additional 7~ hours of various amounts of polish and implementation of graphics. Lots of this was alleviated by the fact that I brought on an artist! She's been super awesome! One of the biggest challenges I feel was finding time to dedicate to this amidst other obligations. It was tough to find the energy after a long day of classes/studying to go through and read about html/css to learn how to add elements to my game. Maybe that's an excuse, but also the reality of it is that my academics came before this jam. I suppose I found striking time management to be a huge barrier to the game's development. Perhaps naively I thought that I would be able to churn on the game late into the night and understand the things I was learning or reading. This was not the case. Twine itself was another challenge. As I began using the engine I saw how it made certain aspects of design easier and others more challenging. 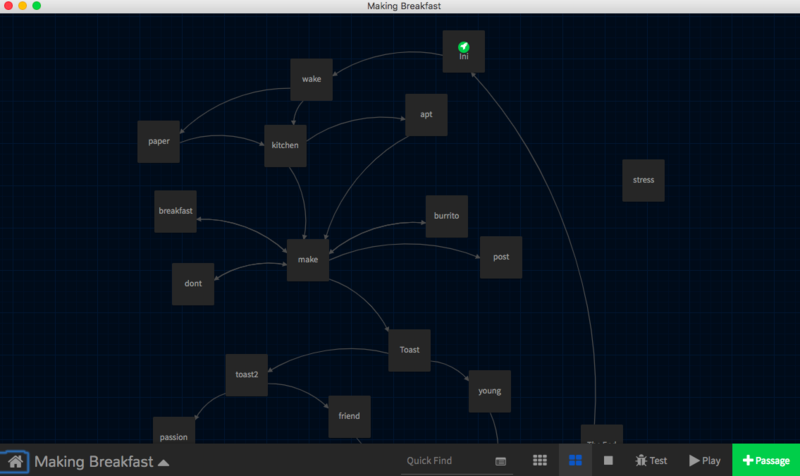 Displaying text and writing in Twine is very simple and intuitive and friendly. But, any kind of graphics whether it be adding images or manipulation of text becomes a challenge very quickly. (without prior knowledge of html). I think moving forward I want to dive deeper into learning HTML/CSS/JS and explore different web based games I can create. I mentioned this earlier but overall I'm pretty proud of the journey I've taken. I feel like I've learned a lot about the process of game design just by trying different things. It's still one of the things that has brought me more joy than lots of other things. I feel like I'm converted and more than anything I just want to do more. Second to Last update probably? Almost there. Worked on some formatting things and learned about creating different classes in html so that I can vary the format of text in a single passage. Here's what that looks like. I've also been playtesting in a browser so I can catch potential formatting issues and see if there are any adjustments that need to be made. So far I've made the text a little larger as well as changed the contrast a little bit. I've also implemented Drop Caps! It looks very nice. Originally was going to include them every so often in the story, but decided that it was distracting. I think I need to format it a little bit better. Currently the text is running right up against the image which isn't desirable, but is also the simplest implementation. I'll continue working on it tomorrow. One of my original design goals that I've utterly failed at is actually writing length. I recently played through the entirety of my game, going through all the endings. Reading everything took about 8 minutes. Which is isn't even close to the 20 minutes I was originally shooting for. One other thing that I've been thinking about is how much I just want to release the game. I have been craving feedback and more than anything I want people to be able to play the game. I want to hear whether or not all the design mumbo jumbo I was thinking about and discussing earlier in this devlog translated into meaningful changes within the game or whether I was off with my implementation. More than anything I think I want to move past the end of the game jam. I want to continue writing for this game and adding content that wouldn't be practical to implement in time given the deadline. Maybe other parts of the protagonist that I want to explore. I've also been thinking about tons of new game ideas and things I want to learn. I'm excited to start something new instead of reading the same things I've written for the 5th time in a row. My First Game Jam: Winter 2018 community · Replied to New Retro Games in [Devlog] Let's Make Breakfast! Hey! Haha. It's interesting! Though I haven't been commenting, I've been following your log as well!! I've been amazed at the progress you've been able to make during the time. Personally I find the amount of complexity that you've been able to add to be super impressive and interesting. See you at the finish line! Is this what Crunch feels like? Though the end of submissions for the Jam is on Saturday, I'll be leaving on a short vacation on Friday. Thus my deadline is closer to noon on Friday. Yet there is still so much to be done... I feel the pressure of the deadline. Worked on finding a good color palette as well as font for the game. I decided to go back to the original palette and cut the idea for the changing backgrounds. Also found out how to add emphasis to certain lines of text. Here's what it looks like now. Also I'm working (very last minute) with an artist to procure a few pieces of art. Hope she comes through. If not I'm sure things will be okay too. I'm also in the process of going through the game and editing parts that I find are tough to play or don't flow naturally. This mostly means rearranging passage links to provide a more meaningful emphasis. For example in the sentence "I'm going to the kitchen". The player should not be clicking on "I'm" to progress but rather "kitchen". Unfortunately some of my early decisions don't really make intuitive sense to the player in this manner. I'm also editing for grammar mistakes and general readability. If something is unclear or ambiguous for example, I've been going through and making changes as necessary. Last thing I want to do is add some more flavor regarding the look and feel. I want to add drop caps like I mentioned and maybe further tweak the setting. I also need to work on a title screen/icon for the game. Thankfully I already have something in mind. As people finish it feels like there are fewer people stopping by to give feedback? Or perhaps they're also heads down working on their games. Haha. Good luck to everyone who's working on finishing. :) Looking forward to playing everything. Super Quick update with what I've been working on. Difficult to find time as I've also been busy running errands. Been playing around with CSS and different palettes. Was originally thinking of changing the background as the player progressed through the story. The idea is to have a visual representation of progress as well as represent the sun as it rises in the mornings. After implementing, I couldn't find a good set of colors and personally found the transition to be too distracting from the more intimate moments of the story. I decided to cut that. Then I was left with finding an appropriate color palette between the text, the background, and the links. I swapped from the original purple to a navy blue type theme. But again I find this to be off a little bit. I think the tone it communicates is a little strange. 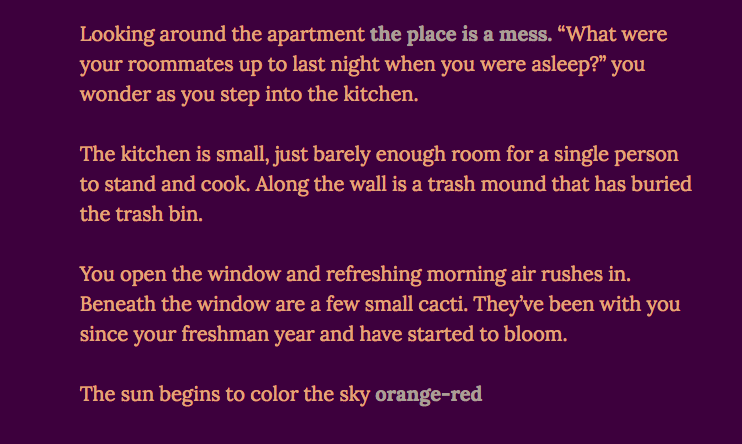 I may go back to the original color scheme of purple on orange text. Not sure yet. Also playing around with font choices and small graphics. I may ask a friend if she has time to draw some things for me. Otherwise I'll likely work on it tomorrow. I finished writing out all the sections! Huzzah! I would still like to go over them in game and see how the pacing feels. But overall I'm feeling good about the content of the writing. In the end, I have 3 endings, and 4ish narrative paths that you can progress down. Two of them end the same way. If you look at the final narrative's structure, it's fairly linear towards the end. This is intentional as I wanted to focus in on specific areas of worry for the protagonist. It's turned out to also be more complex than I would have originally imagined. But I don't think that's a bad thing! It's certainly been a growing experience writing in this manner. Some other smaller points of polish that I would like to iterate on throughout the week. Where to put links. 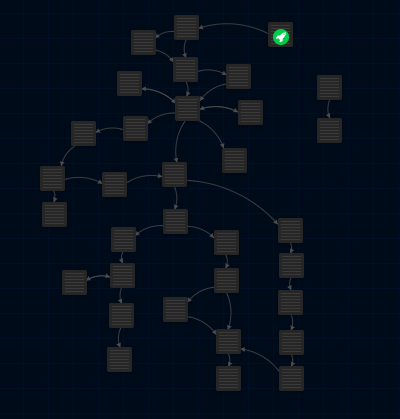 In Twine, the way to progress is typically by linking passages. It's interesting to think about what words to use as links and what that communicates to the player. I think these are a rather natural way to emphasize certain ideas. I think as well there are some areas in which I can do it better. More texture/flavor/world building. Though I the linearity in the second half/end is good I want to go through and add more details by linking to other passages. Fixing Grammar, Word Choice, Clarity, etc... This can always been improved. Or, I suppose more specifically non narrative game stuff. I implemented a save system into the game! It works by checking for the variable $x and "Save A" file at the start of each game session. $x is immediately altered to be 1 after the player begins the first narrative section. "Save A" is the save file that is updated at major narrative points. I believe twine saves this information as cookies? If the player has played at all and $x is 1, then the game should proceed to load the save if the player chooses. Overall, it's fairly rudimentary but my goal is just to give players a way to leave the story and come back where they left off. I don't plan on making it robust enough such that players can "game" their way into discovering the different endings. Honestly, I don't think my game is complex enough for that kind of play. There are few things that I would like to polish. Reading the Postmortem of Will Not Let Me Go by Stephen Granade has given me a lot of ideas in this regard. More uniform fonts. Particularly links. Drop Caps to mark player's progress through the story. Light Graphics. My unfamiliarity with the both art and also implementing graphics into twine makes me hesitate on how much I should lean on this. Will definitely do a pass on the overall aesthetics (colors and font). Update 4: Player Choice pt II and More Writing. Another update with writing progress and thoughts about feedback from the comments. Work on the game has really crawled to a halt as I've been studying for my exams for the past week. I finished the exams today and will probably have more updates as I work on writing over the weekend. I thought I would further update y'all on some specific decisions I made about the structure of the narrative. 1) The protagonist exists alone. That is to say, there is no back and forth dialogue between the protagonist and another character. The high level plot is simply a 20 something college kid makes breakfast before his class. The reason for this specific design is for a few reasons. First, it simplifies the writing process tremendously. Writing another character well was simply out of the scope of what I wanted to accomplish. Secondly, I wanted to create a sense of intimacy. The game essentially exists within the thoughts and actions of a single person's mind and as such I wanted to delve deep into that aspect of the protagonist. Secondly, I wanted to limit the player's agency within the game. The player is not an active member of the plot. In this game I imagine the player more as a curious adventurer within the mind of the protagonist. Instead of influencing the protagonist, you were tasked with uncovering who the protagonist is through reading the thoughts of the protagonist. In a sense you are a passive observer who is given a situation and needs to parse out what is happening. The player here is presented with a choice. They can either click on "some papers" or "you close it". Neither option affects the movement of the protagonist. (ie. clicking "you close it" does not close the door. The protagonist has already walked out of the room and closed it). The option does however lead into areas of the game that can provide greater context or more texture to certain ideas allowing the player to further uncover questions such as "who is the protagonist, why is his/her room messy, etc." It is ultimately up to the player however to be curious and uncover the world. One of the comments above really helped me work through and sharpen my focus on this point. As I've written above, the player is separate from the protag. This can lead to some interesting narrative decisions. What if, for instance, the player wants to do something that would be against the protag's character? How is this addressed through the narrative? What kind of emotions can this bring about? How can this disconnect add depth to the story? The option "Don't Eat" leads to a narrative path about the protagonist's childhood and how breakfast was one of the happy moments of family gathering. It is a narrative hook that I have included both to add detail about the protagonist but also to indue a sense of guilt to the player who decides to choose this. I'm not sure how effective this will be in practice, but we'll see! There are other ways in which I am exploring how including player choice can impact the relationship between the player and the protagonist. Progress has been made! Though it's been slow. I'm about a third of the way through the middle. But I've written out a second ending! Yay! It feels like as I write, the more ambitious the project becomes. It's an enjoyable process but sometimes I have found myself losing sight of the scope and including things without considering them fully. It's also been a lot harder than I anticipated. Keeping track of what kinds of information the player knows given various permutations going through the game has been tough. Interestingly enough I've been keeping up with most of my design goals. There is a lot more detail now in the game with various things that you can learn about or pathways you can explore. Also thinking about player choice and the puzzle of how to write around these game-specific situations is helping me create more interesting narratives I hope. The Goal is to finish writing by Monday and start working on graphics during the week! Let's see how this goes. Being in this process of development has also been really fascinating. All the people I've interacted with have heard by now that I'm working on something and I find myself frequently thinking about other projects: just everyday experiences that I'll go through and think: oh that would make a fun/interesting/weird game. There's this surprising energy and excitement that I have to the development process in general. It's been really fun to play with all these ideas and thoughts and theories that I've read on development sites. Honestly, I don't think I've enjoyed doing anything this much in a long time. My First Game Jam: Winter 2018 community · Replied to J in [Devlog] Let's Make Breakfast! Thanks for taking the time to respond! I'm glad you're enjoying the devlog!! It's really encouraging. Honestly I have found this whole experience and community to be really awesome. Working on this game has been one of the most enjoyable things that I've done in a long time. I'm having a blast. I've also found a lot of the feedback to be surprising in a very challenging way. There are a lot of perspectives and things that I hadn't considered which has been really crucial in fleshing out different aspects of my game. It's been challenging me to consider different parts of my game. Also thank you for the article recommendation and the insight about player choice alongside emotions!! I do actually have thoughts about this and some thoughts about how to incorporate this into my game! I will probably discuss it in an update tomorrow! Another Short update about how I'm incorporating more choice within the player and progressing on the writing. Not much to say here except that as I've been writing, I've begun to lay out a clear beginning, middle, and end sequence. As part of this, I've outlined everything the themes and plot points that I want to flesh out as well. As it turns out writing writing things down and planning narrative has been very helpful. I've also mostly finished writing the beginning of the game! This section I've laid out as everything before the player makes the selection about what to make for breakfast. As I've been writing, I've been keeping in mind my goals listed earlier about providing interesting player choice. I think my goal with writing the game is not to empower the player to alter the narrative, but rather to satiate player curiosity. That is to say, the choices of the player ultimately do not change the story: it's not as if choosing "burrito" somehow gives the protagonist +10 intelligence, but rather optionally allows the player to further explore parts of the narrative: why the apartment is messy, the fridge empty, etc. 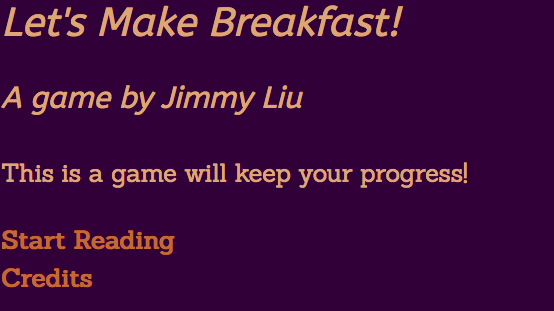 I've focused in on the "make" passage which is when the player is presented the option of what breakfast to make. Ultimately there is still only one choice that progresses the story, but the player is rewarded with more in depth writing and insight into the protagonist's life by choosing the other options. "post" is also a little post game Easter egg about making a burrito that I plan on incorporating. It's less interesting to play through like this. In the "make" passage, there are several options that simply lead to "no". And that's it! Thanks for following. Quick update this time on answering some of the questions I posed before as well as sharing some progress. Narrative Development: Who is the game for? In short, I've decided that this game will be mostly for me and my own sake. This game jam, and making games in general, should be an enjoyable experience! Rather than being concerned about the reception, I'm going to focus in on telling my particular story. Deciding this, as it turns out, has been a fairly liberating experience. It allows me to be more personal and specific with my writing. It also frees me from the self consciousness I've been feeling about whether the writing is "good enough" or the story is "interesting enough". I am hoping that this leads to more detailed world and compelling game to play through. This naturally also answers a lot of other questions about tone, narrative structures, etc. I'm doing a pass on all the writing in the game to flesh out details. I've also finally organized a text document where all the writing can be viewed and worked on apart from inside Twine. It's been really challenging and rewarding finding different ways in to add texture to the world. I've also found that utilizing (click:) is a really clear and simple way to slow the player down and pace the story. Here's an example that is from the first passage I shared about entering the kitchen. Also quick shout out to all you awesome folk for taking the time to follow the log and offer input/support. It really means a lot to me. The community so far has been incredible. Hey! I just wanted to stop by to say that Iove the idea of this game and I think the progress you've been making is pretty incredible! :) I look forward to trying it out. In particular I love that you've invoked A Dark Room!! For me that game in particular was also very interesting in the ways in which approached the player and how they "unfold" so to speak! I really think this Extra Credits Video does a great job of explaining. I think it really depends on what kind of game you are designing. Personally I love games that tell rich stories. So this is also the type of game that I am interested in building! The challenge for me (and for all games with an emphasis on story) is how to design mechanics to reinforce certain ideas/themes etc. Recent example being in Wolfeinstein II. You play a sequence of that game @ 50 health instead of 100. It's a small thing, but it reinforces this narrative point that BJ (the player character) was severely injured and not fully healed yet. On the flip side you can also have very mechanics driven games such as Super Mario Brothers wherein the story falls second to how the levels are designed, how the responsive the controls are, etc. These challenges can be difficult in their own way! Part of the reason why I love games is that there is such diversity in the genre of games. My First Game Jam: Winter 2018 community · Replied to rabbit in [Devlog] Let's Make Breakfast! Thanks for the encouragement!! :) I'll definitely be checking out your recommendations! I'm actually fairly new to the IF genre itself. I'm interested in learning what other people before me have accomplished and what techniques they have used. My First Game Jam: Winter 2018 community · Replied to mariusvnh in [Devlog] Let's Make Breakfast! My First Game Jam: Winter 2018 community · Replied to fleece in [Devlog] Let's Make Breakfast! Yes! My intention is definitely to evoke some tough emotions. The game mirrors a lot of thoughts that I have personally wrestled with as a college student. I'm hoping that others can relate or at least gain some level of understanding about the protag's struggles. Thanks for the encouragement! I appreciate the support. Not sure quite how to structure these updates but I'll take these updates to be something akin to a journal. Both with reflections on various aspects of the game's design as well as reports about progress with implementation. One thing that I've thought a lot about is what kind of stories I want to tell. Though the plot of the game is fairly simple: a protag wakes up, makes breakfast, thinks about things that cause him stress, game ends, I find that there is a lot of narrative freedom. The bulk of the game occurs in the protag's thoughts as he's making breakfast and as such time is not an issue in the narrative. However this freedom has also revealed to me lots of interesting tensions within the design of the narrative. When this is all finished and done, I want the narrative to be tight, succinct, and clearly focused. But even within these frames a vast number of stories can come about. Is the narrative linear? Will the game lock down the player's progression through the mind of the protagonist in a manner similar to that of What Remain's of Edith Finch or Gone Home? Or will there be branching paths that lead to different endings such that the player will need to replay the game to see all the narrative elements? What is the tone of the game funny or heartfelt? Some aspect of the game's premise is absurd and innately humorous. Players expect a game about making breakfast and yet in it's current design the game gets pretty dark. Who is the game for? Perhaps the most important question. Is it for me or for an unknown audience? It's one thing I've been wrestling with as I've been writing. I've never quite shared anything I've made the world and now that I have I worry that some things in the game will be too specific to my personal experience. And consequently less meaningful. Hopefully I'll work out some of these questions in the coming days as I continue writing and development of the game. In a way, this is a continuation of the narrative development. As a reminder, here is the plot of the game: Protag wakes up, Makes breakfast, Thinks about things that cause him stress, Game ends. Within this I have recognized that there is shift for the player currently that occurs at the scene when the protagonist makes breakfast. Prior to the sequence itself the game presents itself as a simple game about making breakfast (based on the title and hopefully some music/graphics?). After this sequence however the player will realize that the heart of the game is something else entirely. All these choices aside from "Toast" and "Cereal" are false choices that have been designed to convey certain narrative elements about the protag's state of being: that is one who does not have money or the time to make anything more complex. Choosing anything other than "Toast" and "Cereal" will yield you text in which the protag laments about his empty fridge and how it's been empty for a few days and subsequently ask the player to choose something else. Originally I simply saw this sequence as a vehicle for conveying the true nature of the game. However now I realize that this is actually a significant sequence from the player's perspective. It is the first time (and one of the few only times) that the game asks the player to interact with the story. Though ultimately the player's choice is an illusion, the choice still can feel significant for the player and can be an opportunity for further narrative delivery. I think expanding on the options that the players have here beyond just "Toast", "Cereal", and a false choice would be a clear way to add complexity to the game that would further invest the player in the narrative. This would also help in creating more varied pathways that the player could follow within the protag's mind leading to alternative endings. You might have seen this in my writing above but one of the ideas that I have taken to is thinking about the player's progression through the mind of the protag as different pathways. This has been really helpful as it allows us to tangibly express something that is difficult to otherwise explore. Thoughts, feelings, and the human mind aren't really something that can be so easily broken up into sections. However for the purposes of this game it is useful to be able to break down specific thoughts of the protagonist and lay them out such that the player can progress through them. In a way these narrative pathways are akin to levels in a fps. This is probably obvious to many people but thinking about the narrative in this matter has helped to clarify lots of things for me personally! Just thought I'd share. Thanks for stopping by and reading! It's a little long, but things are progressing! Updates will probably be slower in the next few days as I take some exams. I swear I'm a good kid. My First Game Jam: Winter 2018 community · Created a new topic [Devlog] Let's Make Breakfast! Hello Everyone! I'm a 21 year old college student. This is my first time attempting to finish a game. Newbie in every regard! I'm coming at it with just the tiniest amount of programming knowledge in Python. I was inspired to join though after discovering Twine and playing through a few Visual Novels/Interactive Fiction Games! Namely: Butterfly Soup, My Uncle Works for Nintendo, and Doki Doki Literature Club! Probably won't be updating every day as I'll be busy working on other things as well. But I'm starting from a pretty strong point I think as I have most of the narrative done and have created something playable in the ~5 hours I've been working on it today. Hope you enjoy following my game! What is "Let's Make Breakfast!" 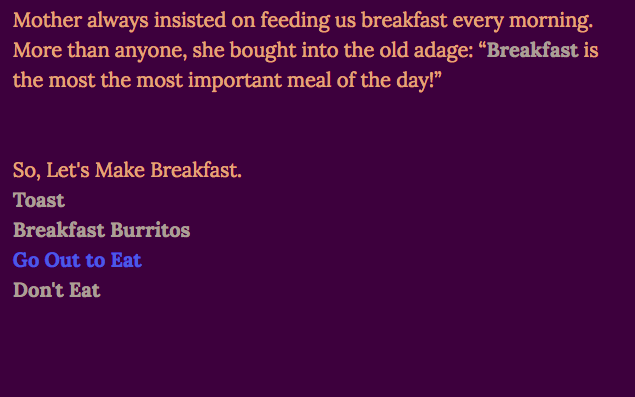 It's a piece of semi-autobiographical Interactive Fiction about being a college student. Through the routine of breakfast, we follow as the protagonist works through his anxieties about money, academics, pressure from family, and self worth. Currently includes 1 ending. It's possible that I will expand on the game and include multiple endings. I want to include some Easter eggs/false or humorous endings. Two big goals for this project. 1) Learn how to write video game narratives. Narrative has always been a big deal for me. I love hearing and telling stories. Some of my favorite games too have always been narrative focused. In this sense, I want to learn how to play to tell strong narratives in games both from a design perspective and from a writing perspective. - Extending Length to be ~20 min of playtime. Playable game created. General story structure has been laid out!